Wheezing, skin irritation, dermatitis, infections, headaches, nerve damage, asthma and birth defects—these are fringe “benefits” offered 1.4 million maids, many recent immigrants in the US, along with $19,570 annual average salary—or roughly $9.41 an hour, according to the Bureau of Labor Statistics. But these “extras” don’t accrue just to the “help.” Whether you have help and inhale “clean” air after homemaking or you are your family’s domestic servant, a new study shows that anyone who does not opt for safer cleaning products puts themselves at high risk for the same indoor pollution-related maladies, including harm to the developing fetus. In the informal world of domestic servants without any kind of government oversight, use of protective gear is rare, adds Dr Sterling. This can have an impact on pregnancy outcomes since many maids, due to low income, must work during pregnancy. Their exposure during pregnancy sets up respiratory problems for their newborns who grow up to be asthmatic adults, something to consider during an age of increasingly socialized healthcare where all share the cost burden of the sick. A study from the October 2013 International Journal of Public Health on the use of household cleaning products during pregnancy, lower respiratory tract infections and wheezing during early life suggest cause and effect. Researchers measured pregnancy outcomes and cleaning product use among four different Spanish populations with 2,292 pregnant women. When infants were 12-18 months old, prevalence of cleaning product use, wheezing and lower respiratory tract problems was reported higher when sprays or air fresheners were used during pregnancy. The odds of wheezing increased with spray and solvent use. The associations between spray and air freshener use during pregnancy remained even when these products were not used after pregnancy. Estimates for wheezing and respiratory infections were even higher when postbirth exposure was included, indicating the sprays are sensitizers and lung irritants. All of this in an ideal world ought to speak to one’s conscience, motivating employers of maids to ensure their help use safer products, but more likely speaks to self-preservation. The help go home, attend different schools. But the same chemicals build up in the indoor air of homes and subsequently in tissues of those who live there. In a series of investigations for the Environmental Protection Agency, the Midwest Research Institute reviewed and analyzed 1,200 household products for a total of 31 specific ingredients. More than 5% of these contained xylene, acetone, 1,1,1-trichloroethane, toluene, ethylbenzene, 1,4-dioxane, chloroform, trichloroethylene and carbon tetrachloride. These cause cancer, birth defects and endocrine disruption. The same organization also analyzed human fat tissues as part of the federal government’s National Human Adipose Tissue Survey that attempts to determine human exposure to industrial chemicals from toxic waste sites and other sources by measuring them in fatty tissues, where they are most likely to accumulate. Many compounds identified in fatty tissues, such as phenylphenol, are common constituents in household cleaning compounds. The irony is while releases of these chemicals must be reported publicly if they are emitted from a smokestack industry or found at hazardous waste sites—the household cleaning product industry is under no similar obligation to tell consumers they are bringing these same chemicals into their homes via cleaning products. In the July 2010 issue of Environmental Health, a case control study looked at some 787 Cape Cod, Massachusetts women diagnosed with breast cancer and the same approximate number of women without the disease. Breast cancer risk increased twofold among women reporting the highest household cleaning product use compared with those who reported the least. 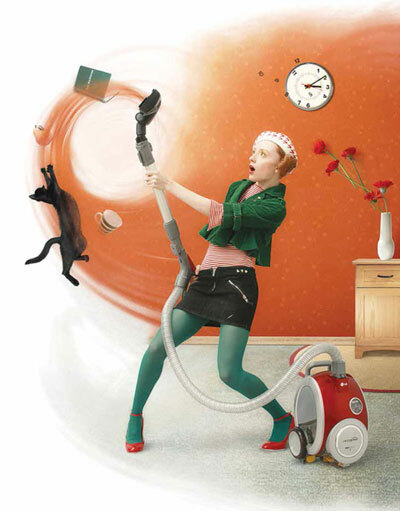 When one eliminates distinctions that separate people—us versus them—the outright toxicity of home cleaning products becomes a societal concern. Fewer asthma cases are possible, but people who employ help don’t always buy low-toxin cleaning products. Most, as interviews with the “help” indicate, buy major brands. Dr Sterling performed toxicity tests on four known household cleaning products: Comet Bathroom Cleaner, 409 All Purpose Cleaner, Lysol Direct Cleaner and Tilex Soap Scum Remover. When adult fruit fly females were fed on dilutions of the cleaners, the researcher found toxicity at low levels of exposure. All exposed females were dead within 48 hours when given only a 20% solution of Comet Bathroom Cleaner. Sixteen of 20 females died within the same time period when exposed to the same dilution of 409 All Purpose Cleaner. A 30% solution of Lysol Direct Cleaner killed all female fruit flies within 48 hours. The same dilution of Tilex Soap Scum Remover killed all of the flies within the same time period. The significance of these findings goes beyond the relevance to insects in that the genetic damage suffered by this particular species correlates well with results from human test systems. Experts say public education could change this scenario and reduce diseases related to cleaning products. But it isn’t so easy. The population of maids is characterized by lack of even a high school diploma, so assuming that they’re going to be empowered to read labels, decipher what chemical effects are and then stand up to an employer is ludicrous. In addition, while food labeling laws frequently go through revamps, little oversight exists for household cleaning products, which are governed by a patchwork of federal and state laws and commissions as well as Congress. Government does almost nothing to educate in the US on safe cleaning products, despite their implications for the health of over one million workers. Public interest groups such as HealthyLivinG Foundation, a California-based nonprofit charity, have made it their mission to educate about hazards in products. The foundation advocates full ingredient disclosures on labels, including preservatives and fragrance. When the group tested products made with and without petrochemicals (Earth Friendly Products’ Parsley Plus without petrochemicals versus Simple Green made with them), they found that the product with solvents such as butyl cellosolve (a suspect carcinogen) emitted tenfold more VOCs than the low-toxin product. The group says this indicates the low-toxin product is safer to use. In another test the organization performed, laundry detergents from Procter & Gamble contained 1,4-dioxane (not listed on label) but the low-toxin formulas did not. Bédard A, Varraso R, Sanchez M, Clavel-Chapelon F, Zock JP, Kauffmann F, Le Moual N. Cleaning sprays, household help and asthma among elderly women. Respir Med. 2014 Jan;108(1):171-180. doi: 10.1016/j.rmed.2013.10.018. E-pub 2013 Oct 31. Casas L, Zock JP, Carsin AE, Fernandez-Somoano A, Esplugues A, Santa-Marina L, Tardón A, Ballester F, Basterrechea M, Sunyer J. The use of household cleaning products during pregnancy and lower respiratory tract infections and wheezing during early life. Int J Public Health. 2013 Oct;58(5):757-764. doi: 10.1007/s00038-012-0417-2. E-pub 2012 Oct 11. Zota AR, Aschengrau A, Rudel RA, Brody JG. Self-reported chemicals exposure, beliefs about disease causation, and risk of breast cancer in the Cape Cod Breast Cancer and Environment Study: a casecontrol study. Environ Health. 2010 Jul 20;9:40. doi: 10.1186/1476-069X-9-40.